Fair. 0133405680 PLEASE READ! This book WILL contain heavy wear, excessive highlighting/writing, loose binding, AND/OR water damage. Supplemental materials such as CDs or access codes may NOT be included regardless of title. Contact us with any questions! Fair. 0133405680 **PLEASE NOTE** This is an Instructors Edition Book. May have minor wear and tear, highlighting, writing and/or tape/stickers on the cover but content is not affected. Regardless of the book title, CD/DVD/Access Codes or Supplemental Materials are not guaranteed. Content is the same as the Student Edition, however it may have instructor notes and answers. **Not All Instructor Editions Have Answers, ask before buying if that is what you are looking for** This book is not a rental. Good. 0133405680 US Edition Textbook, May Have Highlights, Notes and/or Underlining, BOOK ONLY-NO ACCESS CODE, NO CD, Ships with Emailed Tracking from USA. New. 0133405680 BRAND NEW W/FAST SHIPPING! 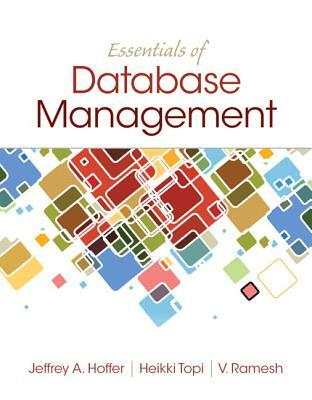 This item is: Essentials of Database Management, 1st Ed., 2014, by Hoffer, Jeffrey A. ^Topi, Heikki^Venkataraman, Ramesh; FORMAT: Paperback; ISBN: 9780133405682. Choose Expedited for fastest shipping! Our 98%+ rating proves our commitment! We cannot ship to PO Boxes/APO address. To avoid ordering the wrong item, please check your item's ISBN number!